I received a nice Duckmeter from Ozeri today to try. It's fun that our kids are growing from infant to toddler. They seem to be fascinated with water even more. My son loves to play every time we give him a bath. And for some reasons, he always complains whenever I get his bath ready because it's too hot or sometimes its too cold. I can't quite tell if what's warm and enough for him as it is for me. I guess kids can tell if the water is too hot or cold. And so the Duckmeter is here to the rescue. The product arrives in the mail through the UPS. 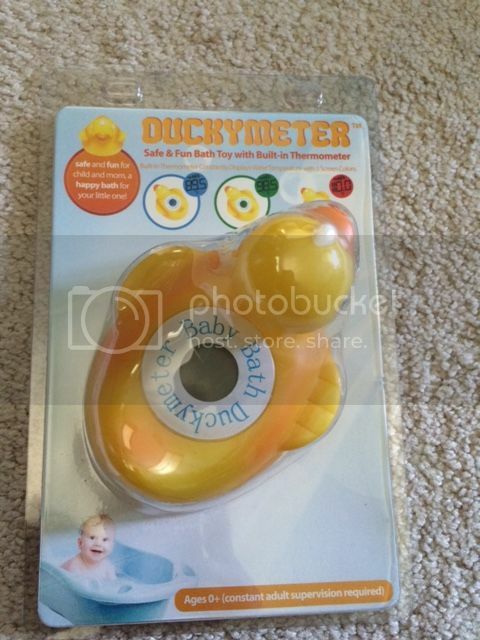 Duckmeter has a built-in thermometer inside a rubber duck. It's like the purpose of the product is dual a playful rubber ducky and a thermometer in one. I love how it changes color to determine the temperature. Blue means cold, green mean just right and red means hot. It's funny now that my son knows what temperature goes to what color. He'll tell me that it's too cold the first time I run the water and turn it to hot and then the Duckmeter will change its color into green. That's when he gets in the tub and knows that the water is just right for him. Just quick to use, no need of some kind of manual instruction to use the item. Accurate, useful and fun for kids at the same time, batteries can also be changed in a quick way. Secure and absolutely adorable and sturdy. That's a cute dual-purpose toy for your kiddo. Protects him if water gets too hot..innovative. Ayos. This will come in very handy everytime kids take a bath. Accurate naman kay ang reading? I have this for my granddaughters and this is so cute. It easily tells you if the water is too hot or too cold. Hmmmn, it would have been nice to have this when my kids were little. This is actually the first time I heard of a duckmeter. It seems like a great product for mommies with infants.